Figure 16.51 below shows a graph of the propagation of a mechanical wave. What is the wavelength of this wave? Figure 16.51 The graph shows the propagation of a mechanical wave. This is College Physics Answers with Shaun Dychko. 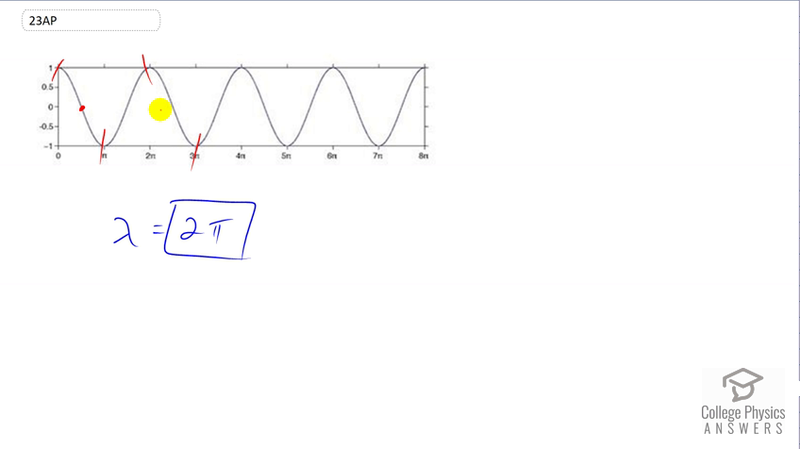 The wavelength of a wave goes from peak to peak or trough to trough or node to corresponding node. We can go from peak to peak here, that's the easiest thing to do. And so it begins here and then it finishes one oscillation here at a position two Pi from the origin. So the wavelength is two Pi. It's not really clear what the units are in this picture, it doesn't tell us what they are. So, all we can say is two Pi.